(CNN) -- Australian authorities have declared several coastal areas near Brisbane disaster zones after a massive oil spill earlier this week, according to the Queensland government. 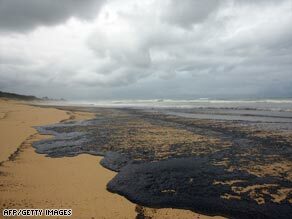 Large stretches of Queensland's coastline are being affected by the oil. "This is a very serious situation," Queensland Premier Anna Bligh said, according to a news release on Friday. "It appears the volume of oil involved is much greater than originally reported by the Pacific Adventurer. And the effect of the oil spill is more widespread." The Pacific Adventurer sustained damage early Wednesday when Cyclone Hamish struck the waters of eastern Australia with more than 125 kph (77 mph) winds. The cargo ship lost 30 of its 50 containers of ammonium nitrate about 13 kilometers (8 miles) off the coast of Cape Moreton. Those containers are still missing. The ship's owner, Swire Shipping, initially said no more than 42,000 liters (11,100 U.S. gallons) of oil escaped from the ship, but now says that "substantially more oil was spilled," ABC reported Friday. The ship is currently in the custody of Australia's Maritime Safety Authority in Brisbane, as the investigation into the spill continues. A massive clean-up effort is also under way. So far, 13 oil-covered birds have been recovered, according to the Queensland government.